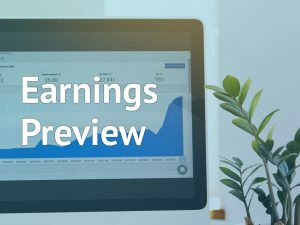 Twitter (NYSE: TWTR) reported a 180% jump in earnings for the fourth quarter as better-than-expected performance across most products and geographies drove revenue higher by 24%. The results exceeded analysts’ expectations. However, the microblogging site guided first-quarter revenue below consensus estimates, sending the stock down over 7% in the premarket. Net income climbed 180% to $255 million and earnings soared 175% to $0.33 per share. 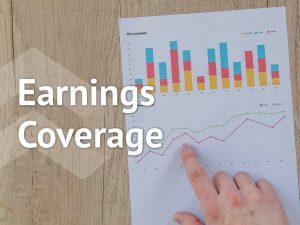 Non-GAAP earnings increased 63% to $0.31 per share. Revenue grew 24% to $909 million. Revenue increased by 26% year-over-year on a constant currency basis. Advertising revenue surged 23% to $791 million driven by a 33% year-over-year growth in total ad engagements despite a 7% drop in cost per engagement. 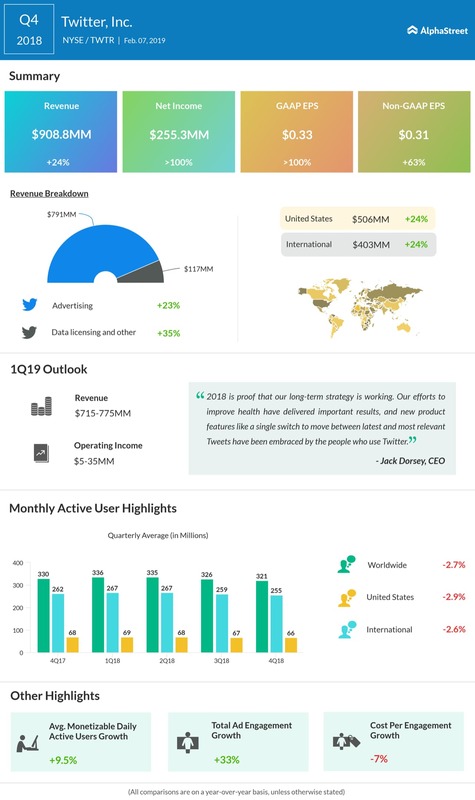 Twitter Q4 2018 Earnings InfographicLooking ahead into the first quarter of fiscal 2019, the company expects total revenue in the range of $715 million to $775 million and GAAP operating income in the range of $5 million to $35 million. For the full year 2019, Twitter predicts GAAP and cash operating expenses to be up about 20% as the company supports its existing priorities of health, conversation, revenue product and sales, and platform. Stock-based compensation expense is predicted to be in the range of $350 million to $400 million. Capital expenditures are anticipated to be between $550 million and $600 million. For the fourth quarter, average monetizable daily active users rose 9% to 126 million driven by a combination of organic growth, marketing, and product improvements. The company saw double-digit growth in five out of its top 10 global markets, demonstrating another quarter of broad-based growth. Value for advertisers continued to improve in Q4, driven by ongoing ad engagement growth, improved product features, better ad relevance, and better pricing. Owned and operated advertising revenue jumped 26% to $749 million. Video ad formats continued to be its fastest-growing ad format in Q4, driven by strength in Video Website Card, in-stream pre-roll, and First View ads. The video was more than half of ad revenue for Q4. The company and its peers are currently facing the ongoing clean-up of accounts and data privacy issues. In the fourth quarter, average monthly active users fell by 9 million year-over-year to 321 million users, due to the cleaning up of fake and vicious accounts from its platform. The reason for the drop in users is due to the introduction of the General Data Protection Regulation (GDPR) in the European Union for removing dubious accounts. The clean-up is likely to eat up the users’ metrics in the fourth quarter. Revenue from advertisers for displaying ads on its platform could continue to be the company’s biggest money spinner. For ad dollars, Twitter is competing with more nimble rivals like Facebook (FB), Google (GOOG), Amazon (AMZN) and Snapchat (SNAP). Apart from the clean-up and data privacy issues, the monthly active users were also hurt by the product changes that lowered the number of email notifications sent, as well as the decisions it has made to prioritize the health of the service and not move to paid SMS carrier relationships in certain markets. Shares of Twitter ended Wednesday’s regular session down 0.61% at $34.16 on the NYSE. The stock has risen over 35% in the past year and over 14% in the past month.